Nicholas Burke and Richard Wasnock, aka Scandinavian Vikings Steinarr Aggarson and Magnus Ulfgarsson, are living out their dreams through the Society for Creative Anachronism (SCA) – an international organization consisting of 19 kingdoms, with over 30,000 members studying and recreating Medieval European cultures. Euan Forrester from Vancouver, Canada, have for the last few years been working on a photography project about the SCA. 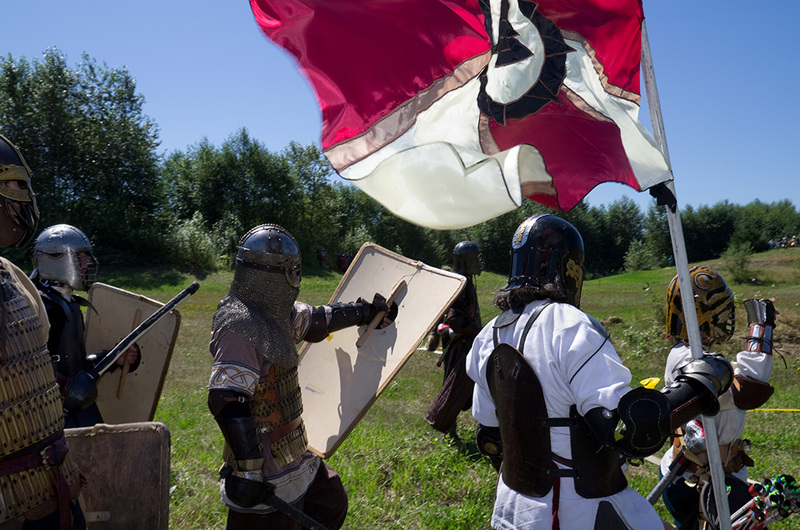 Euan tells ThorNews that he is trying to show what it is like to be in the SCA and specifically what it is like to do heavy combat, where participants fight using swords and shields while wearing armor. 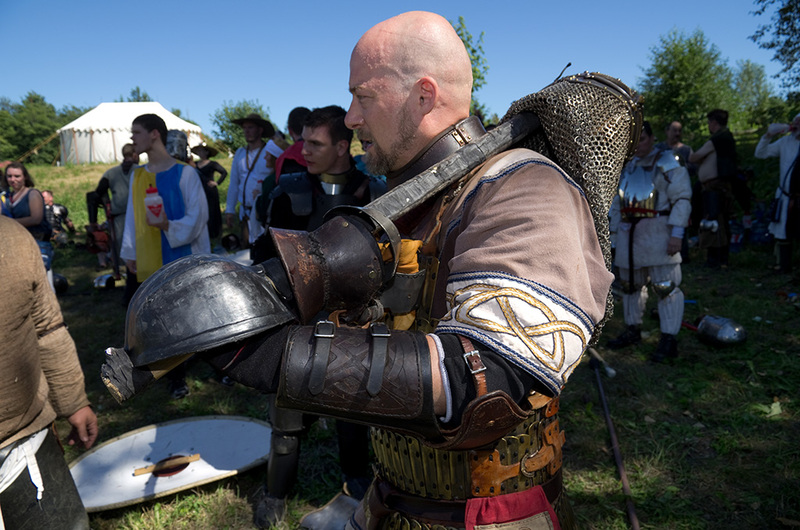 “I tried to show not only the tournaments and wars and big ceremonies, but also what goes on behind the scenes to make them happen: Making armor and clothing, training at home, and going to fight practice. This project has been interesting to me for a lot of reasons: First and foremost Nick (Editor’s note: Nicholas Burke) and I have been friends for a long time, and the opportunity to get to know him better and learn about this culture through his eyes was one I couldn’t resist. But I think the most interesting thing about the group for me is that everywhere you look there’s interesting stuff to dig into. If you ask someone why what the SCA means to them, you’ll get a story about how they’ve been coming for twenty years and they feel like this is their family. If you ask someone about the last fight they were in, they’ll tell you about the strategy they used that they’ve been practicing for the last three months. With the photos and comments blow, Euan gives us a glimpse into Nick’s and Richard’s lives as the Viking personas Steinarr Aggarson and Magnus Ulfgarsson. 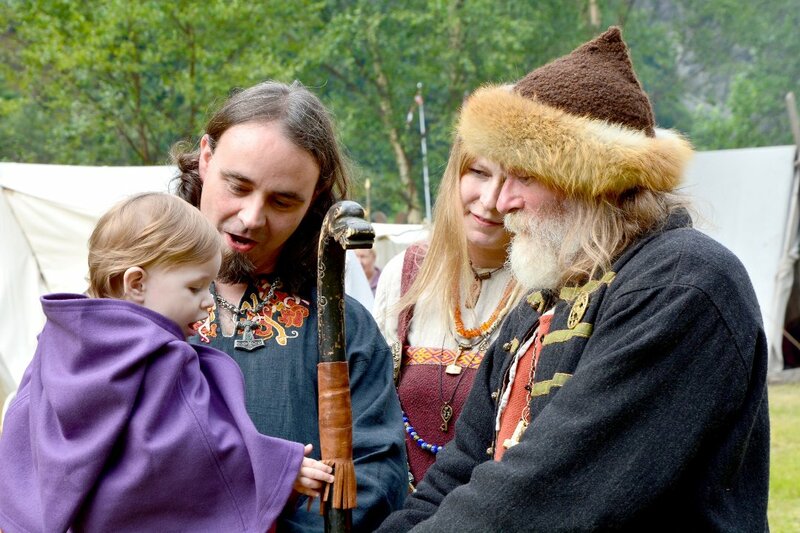 Nick (the second fighter from the left, facing the camera), aka Steinarr Aggarson, a 9th-10th century Swedish Viking, at the An Tir September Crown event, the Nix Ranch in Chehalis, Washington, USA, September 2010. 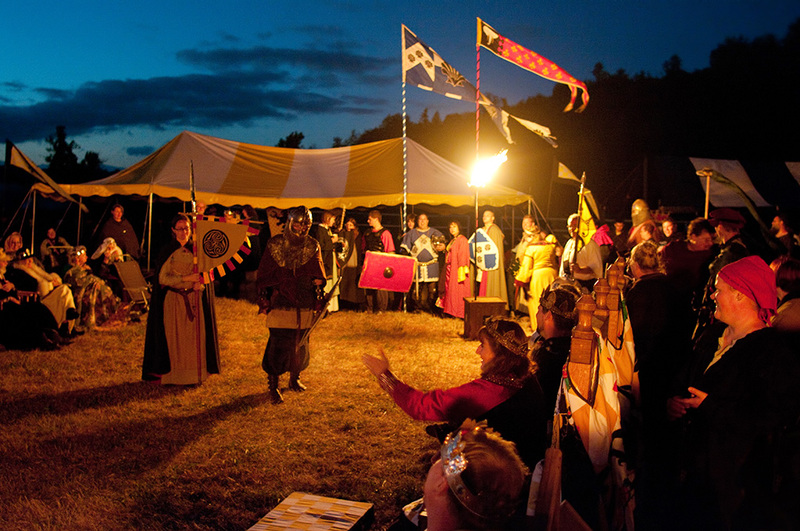 The winner of the An Tir Crown tournament will be the next King or Queen of the Kingdom of An Tir. A reign lasts six months. 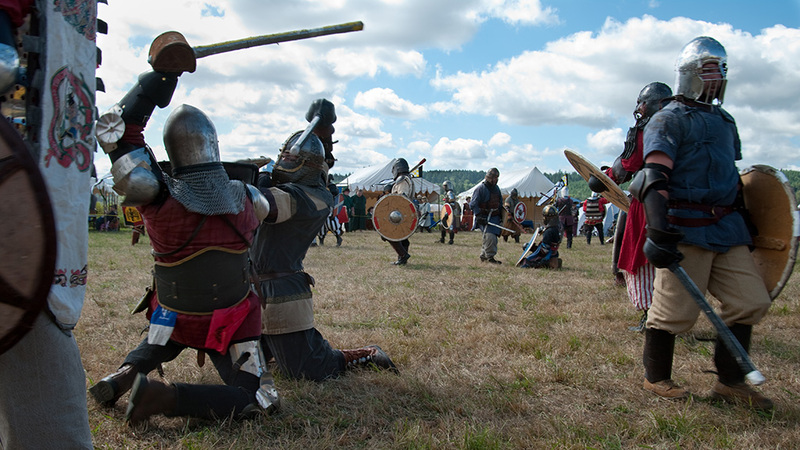 In this photo, Nick is fighting in the Squires Tournament where squires hope to get noticed to help their promotion to become a knight. Nick was not yet a squire at the time of this photo, but was asked to participate because he’s a strong fighter. Nick (center-left, facing the camera) at the An Tir September Crown event, September 2010. 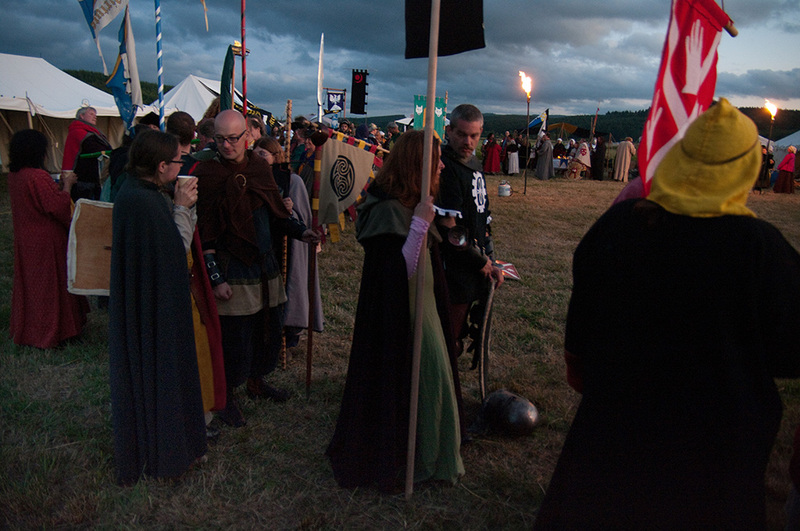 After the tournaments on the first day, participants line up for an audience with the King and Queen, where they will describe the history of their personas. Nick is wearing a classic Viking square cloak with a cloak pin, rus pants, and his banner is inspired by the Raven banner. Nick (center-left, facing the camera) at the An Tir September Crown event in September 2010 with his “inspiration”: The person who he is “fighting for”. Usually this is a significant other, but it can be anyone. This person will become Queen/King if the fighter becomes King/Queen. This occurred shortly after the photo above of them standing in line. Nick (the fighter on the right) at the SCA event Ursulmas at the Evergreen State Fairgrounds in Monroe, Washington, USA, January 2011. 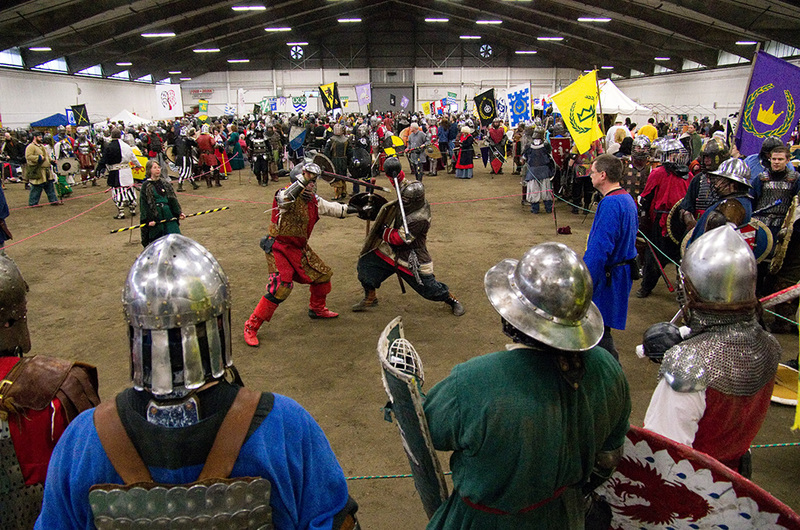 Ursulmas is a tournament-style event, meaning that fighters fight in pairs and a single winner is declared (there are also smaller tournaments at the same event, for squires, or fighters over 40, etc). There is nothing on the line except glory. 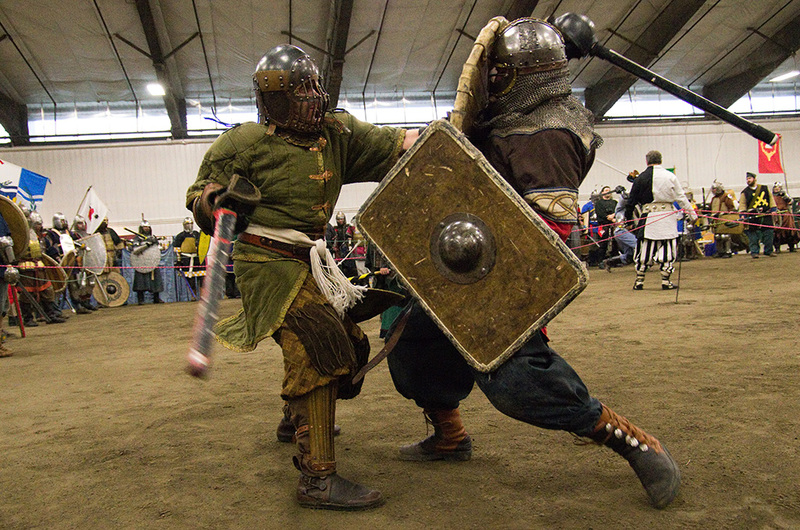 Nick (the fighter on the right) is fighting someone who also is a Viking persona at the Ursulmas event, January 2011. Nick at the SCA event Tournament of Armies II in Aldergrove Lake Regional Park, British Columbia, Canada, August 2012. The bracers were made as a gift by Richard Wasnock. They depict the Wyvern: The symbol of their original household, the Dark Wyverns. At this time of this photo, Nick was a Squire. He has since been promoted to knight. 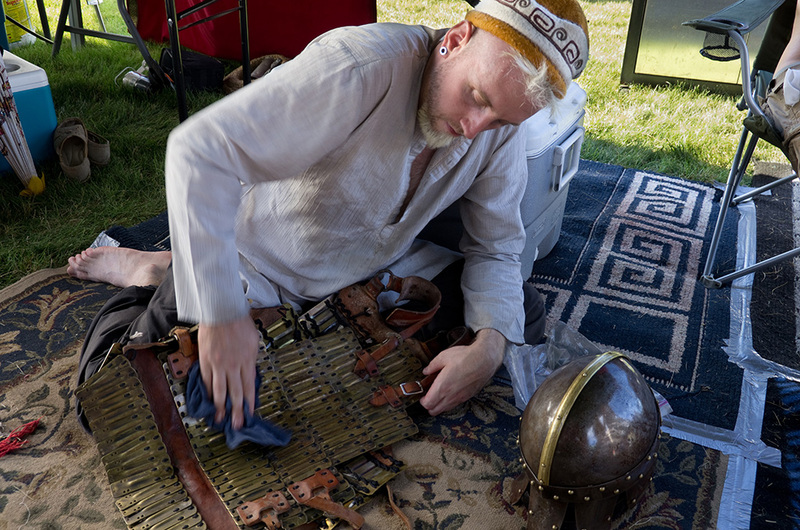 Richard Wasnock, aka Viking persona Magnus Ulfgarsson, polishing his lamellar armor at the Tournament of Armies II, August 2012. Richard’s apartment and workshop in Vancouver, January 2011. 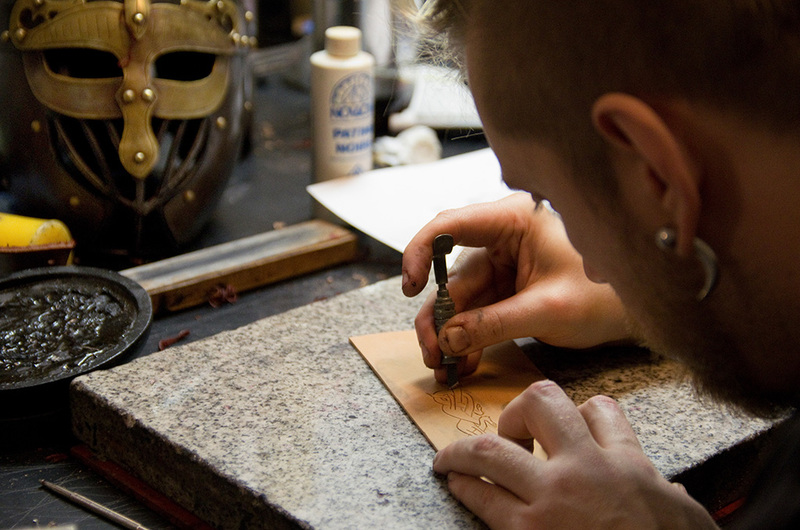 In addition to being a fighter, Richard is also a leatherworker. He does leatherwork under the name Dark Horse Custom Leather. Here he is working on the belt Nick will be given when he becomes a squire. In the background is Richard’s helmet: “I fell in love with my helm by Aesir Metalwyrks the first time I saw him post it online. It’s a sporty SCA helm, with aspects of the Vendel and Valsgard dig sites”. The symbols he is carving are Nick’s arms. 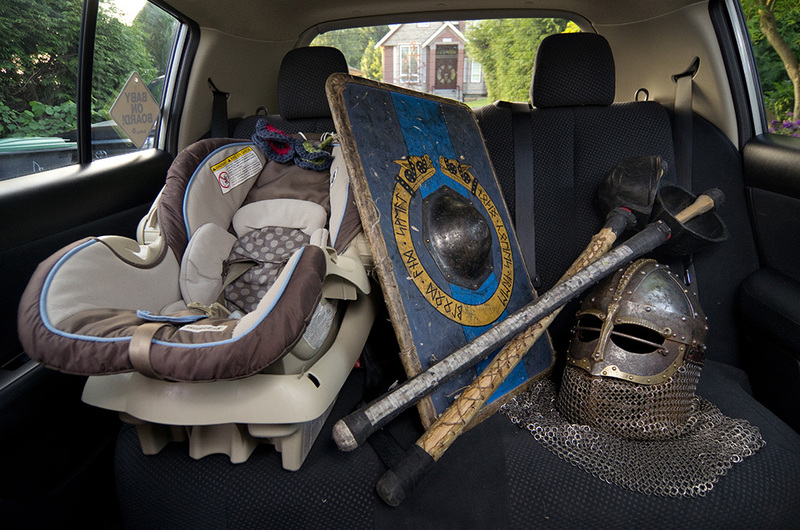 Nick is a new father who must now balance his time in the SCA with his new responsibilities. The writing on his shield says “Blood and sweat, Nothing comes free” in Norse runes. It also depicts two dog heads, which are his personal arms. You can learn more about the Vikings here on ThorNews. Amazing dedication to this. Seems like an expensive hobby. It’s not too bad actually. There is a very DYI spirit, and lots of people tend to teach different crafts and skills. Usually you can make things that looks pretty good with a little sweat equity. Great commitment to the art. It looks like a lot of fun. For your first event, all you need is the admission fee- if any. We can even loan you clothing to wear. After that, you can make cheap basic gear for about the cost of dinner and a movie, or you can spend six month’s income on the best work of the best professionals; your choice.